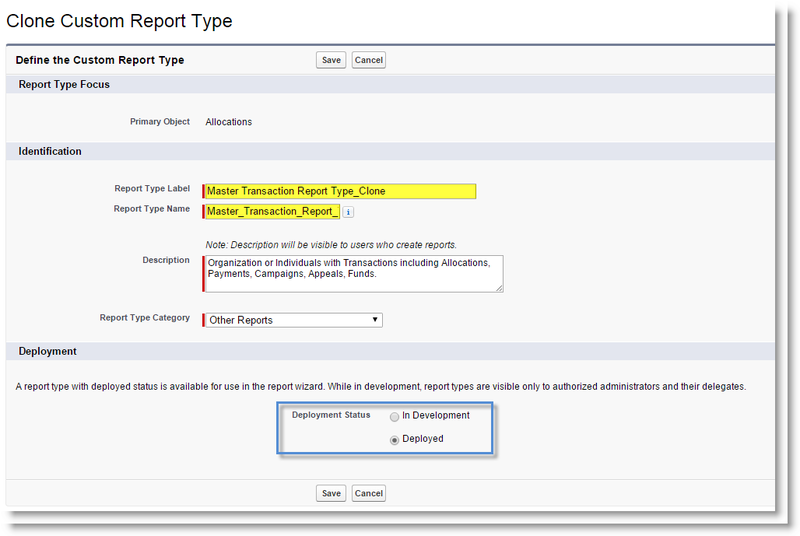 The Master Transaction Report Type is a canned report type that is available for you as part of Causeview, which you can use in building your own reports. Report Types essentially dictate which objects you can report on. For example, if you would like to be able to report on Organizations, you would select "Organizations" as a Report Type. If you want to report on Organizations as well as the Individuals within those Organizations, then you would select "Individuals & Organizations" as a Report Type instead. Since Report Types play an important role on being able to report on specific information, it is then important to select the appropriate Report Type to use. The Master Transaction Report Type allows you to build a report containing Organizations or Individuals with Transactions including Allocations, Payments, Campaigns, Appeals and Funds. 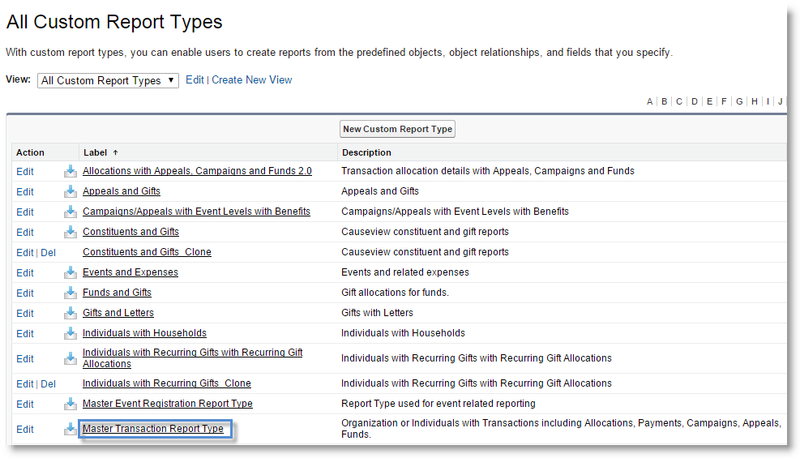 Since the Master Transaction Report Type combines the most common objects you use in Causeview, this makes it an ideal report type to use if you are trying to pull Allocation information such as the Appeal or Fund the gift was designated to, including Payment, Transaction and donor details. Go to the Reports Tab and click on the "New Report" button. Enter the word "Master" in the search box. The Master Transaction Report Type will appear as an option. Select "Master Transaction Report Type" and click on "Create". 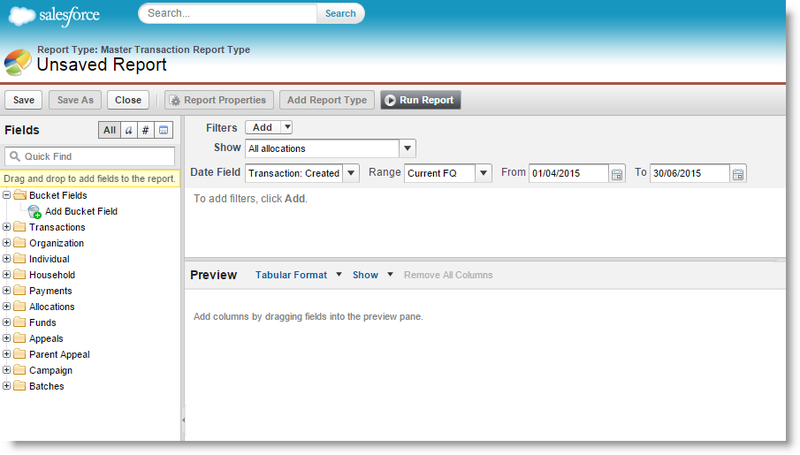 You can now build your report using the native Salesforce reporting functionality. Notice that you can include information from all the objects listed in the Field pane to the left of the report builder. It is important to note though that the Allocation object is the Primary Object used for the Master Transaction Report Type. This means that every Allocation record will appear as a separate line on the report. For example, if you have a $100 one-time gift from Tom Desmond and the gift has split allocations (a portion of the gift has been allocated to a General Operating Fund and a portion to a Sponsorship Fund), then each Allocation will appear on the report. You can choose to group or summarize the data to consolidate the information on the report. The Master Transaction Report Type is a managed report type, meaning that it is deployed as part of an installed package - Causeview. As such, you will not be able to make changes to it. 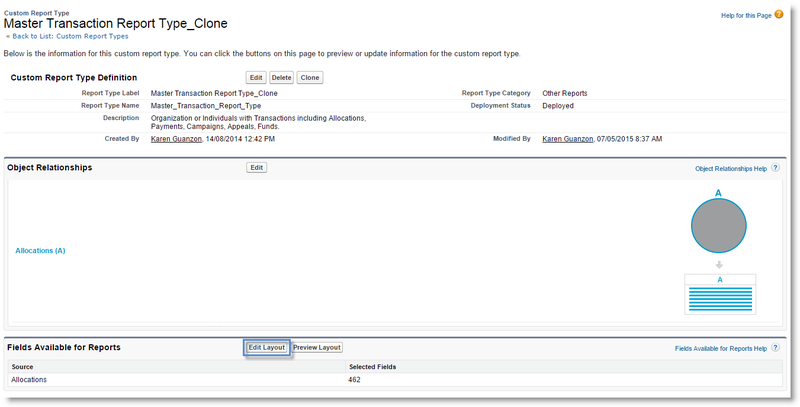 However, you can clone the Master Transaction Report Type and add fields to the cloned version. 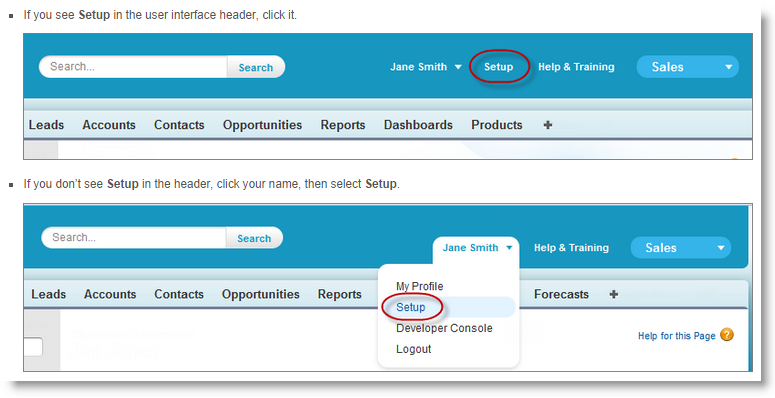 You can follow the steps outline below to create a clone and add fields to the clone. On the left side of the page you will see a section labeled "App Setup" (in some instances this is labeled as "Build"). 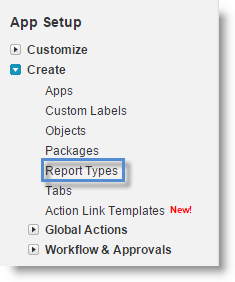 Expand "Create" and click on "Report Types". A list of Custom Report Types will be displayed on the page. Click on "Master Transaction Report Type". Click on the "Clone" button on top of the page. Modify the Report Type Label and Report Type Name so that it is a unique name. In the example below, we’ve simply added "_Clone" to the name to make it unique. Then, select "Deployed" for Deployment Status and click on "Save". Once saved, the page will refresh and take you the cloned version of the Master Transaction Report Type. Scroll down the page to the section called "Fields Available for Reports" and click on the "Edit Layout" button. 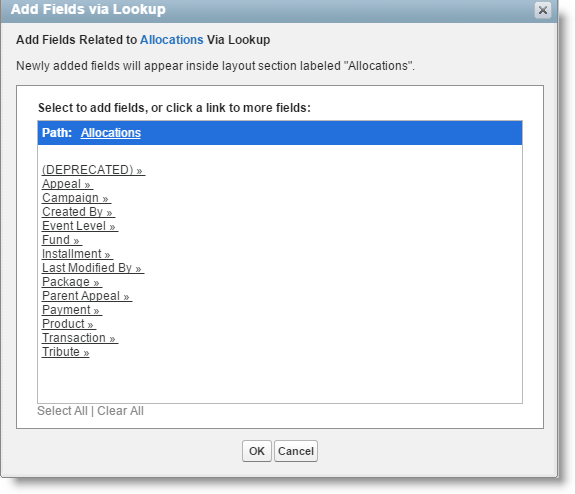 On the Edit Layout page, click on "Add fields related via lookup" found to the right of the page. A window will open with a list of Objects included in this report type. Click on the object where the field you wish to add is located. 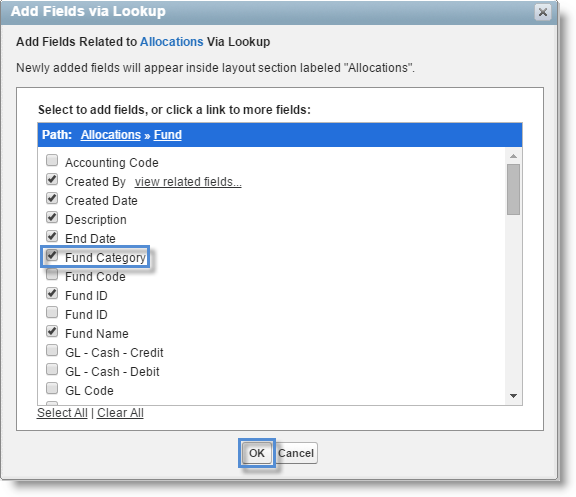 For example, if I want to add "Fund Category" to the list of available fields on the report, then I would click on Fund. The list will expand to display all fields in the Fund Object. This will include any custom fields you may have added to the application. Place a checkmark beside the field you wish to add to the report type and click on the "OK" button at the bottom of the window. Repeat this step until you've added all the fields you need. Once you've added all the fields, click on the "Save" button.